You’ve got to start somewhere on your new DIY basement project, and getting inspired is the best place I know. Along with all the resources you’ll find on this website, such as all of my start-to-finish posts, there are a few great places to do this. We all know about the great Google machine. Use it to your advantage. 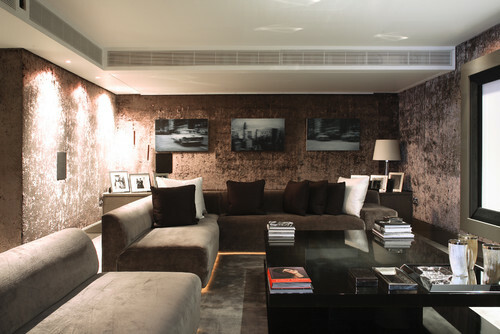 Another great place to get inspired to design your new basement is Pinterest. Ladies, you know what I’m talking about. Fellas, if you haven’t heard of Pinterest I’m guessing there’s not many women in your life. That being said, don’t be afraid to use it. As long as your girl doesn’t catch you snooping around on her Pinterest account you’ll be fine. If she does, you can blame me, I can take it. Pinterest is one of the best sites I know for collecting design ideas and saving them for your future DIY projects. When getting started on finishing your basement, you should use this site to see what you can find. I really like this setup. The lighting, furniture, and rec area are all great. Another cool setup. I focus on three things mostly in inspiration mode – lighting, furniture, and colors – while noting creative ideas I come across here and there. 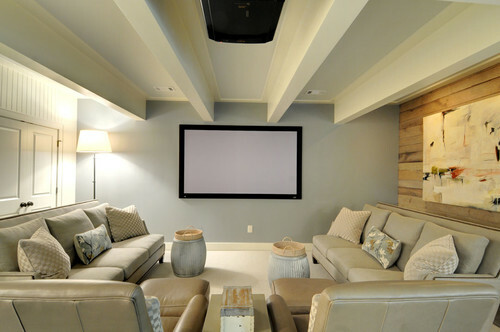 If a basement home theater is in your sights, this furniture setup is killer. For me the home theater was nearly impossible to wrap my head around. I did so much research when I thought I had a decision made I would find a review or forum that disagreed with the decision I had made. It was like pulling my hair out trying to decide what I wanted to do. Hopefully these pictures have helped inspire you in some way. This is your basement and you can do what you want with it, don’t hold back now. Hey Tony how you doing.Just want to ask if can give me some insight on how to go about in building a bed room in my basement for my son. Hey Sohan. By all means, let me know what kind of questions you have and I’ll do my best to help!